What The Eternal Frost Mod does? In the Freezer, you?ll end up underground in a beautiful world made ? ?of stone freezer, ice, snow and water ?half cold? that will make the damage. You will find of course frozen glowstone. 74 Blocks : Every block are different and some are totally awesome ! 1 special water : Frozen water ( You take damage on it ). 1 special fire : Blue fire, slow and damage you. 1 Dimension : Eternal Frost, totally epic generation to layer 256 ! 2 Furnace : Ice Oven who can transform lot of things on other ( View Image bellow ), Frozen furnace wich is the inverse of Ice Oven. Epic items, armor to obtain in dungeon, totally unique. An hypothermia bar for more real thing. 15 sounds and some musics. 14 achievement : For make an objective. 5 Biomes, on surface for an epic generation : Freezer, Freezer Jungle, Eternal Moutain, Eternal Desert and Frozen Plain. 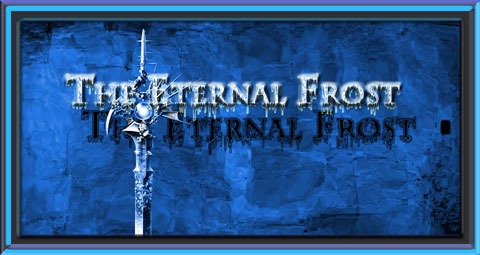 Put The Eternal Frost Mod zip file into your /.minecraft/mods folder. Do not unzip it. As always, a lot of bugs corrected. Support for 1.6.4 version of minecraft. Better dungeon, fit more with SMP. I?m now working on the EF2..